Apologetics Press - Is the Large Hadron Collider a Big Bang Machine? In the news, it has been dubbed the “Big Bang Machine” (Boyle, 2008; “‘Big Bang’ Machine…, 2010; Than, 2011), but what exactly is the Large Hadron Collider (LHC) and what does it have to do, if anything, with the Big Bang? Constructed by the European Organization for Nuclear Research (CERN) and located along the French-Swiss border, the LHC is the world’s largest particle accelerator and has been described as “the largest and most sophisticated scientific instrument ever built” (“CERN Inaugurates...,” 2008). 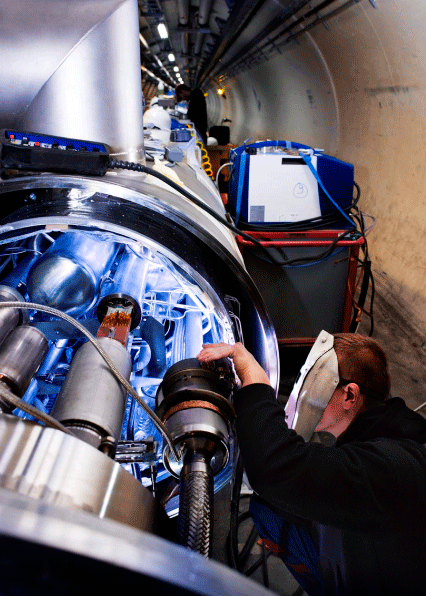 Located about 100 meters (330 feet) underground, the LHC can accelerate a beam of protons to 99.99% the speed of light through an ultra-high vacuum beam-pipe connected in a large, circular circuit, almost 27 kilometers (17 miles) in circumference. The enormous magnets that direct the particle beams along their paths are cryogenically cooled to only 1.9 degrees above absolute zero (-271.3 deg C) (“Facts and Figures,” 2008). Along the beam’s path are four large detectors, of which the ATLAS detector represents the largest particle detector ever built, having a volume of over 28,000 cubic meters (7.4 million gallons) and weighing some 7,000 tons (“ATLAS—A Toroidal...,” 2008). With regard to its connection to Big Bang cosmology, a CERN press release from September 2, 2003 declared, “By colliding particles at extremely high energies, the LHC should shed light on such questions as...What was the state of matter a few microseconds after the Big Bang?” (“CERN Celebrates Discoveries...,” 2003). Three years later in 2006, a similar statement was made in an October press release, that the LHC “possesses enough energy to recreate the first instances of the Big Bang” (“Stephen Hawking Tours...,” 2006). Some have even circulated speculations that the LHC will create micro-black holes and recreate the Big Bang, and global news stories seem to insinuate the LHC will solve all the remaining questions concerning how the Universe arose from a Big Bang. In fact, a video titled “Big Bang v2.0,” produced with support from the Science and Technology Facilities Council (a national research council in the United Kingdom), introduces the LHC under the auspices of being able to answer science’s biggest questions (“Big Bang v2.0,” n.d.). The video’s introduction displays the following questions: “What is Dark Matter?” “Why do things have mass?” “What happened at the Big Bang?” The next two frames give their reply: “The biggest questions in science will be answered... by the biggest experiment in history.” Yet, can the LHC really give the world what the headlines claim (cf. Miller, 2011a; Miller, 2011b)? It seems that a reality check is badly needed—one that is apart from all the sensational press and flashy media presentations. recreating energies that are continually being produced naturally (by high energy cosmic rays hitting the earth’s atmosphere) but at will and inside sophisticated detectors that track what is happening. No Big Bang—so no possibility of creating a new Universe (“LHC ‘Big Questions’,” 2012b). First, a quick note: although the final sentence declares, “No Big Bang,” the author is not implying a denial of the Big Bang Theory, but rather this summarizing statement, taken in context, is declaring that no experiment will create a Universe, wherein scientists would be able to watch space-time and matter unfold. Next, notice in the response how it is repeatedly emphasized the experiments performed are attempts at “recreating” a set of energies or conditions thought to have been present shortly after the Big Bang. It is these extreme ranges of parameters that many scientists believe are in some form analogous to conditions shortly after the Big Bang. Their goal, therefore, is not and cannot be to generate, reproduce, or in any way initiate an event similar to what is alleged by the Big Bang Theory. Rather, they simply are generating a certain range of energy conditions. Sadly, their attempts at correcting this misconception are obscured, if not contradicted, even within their own Web site. The LHC will collide lead nuclei so that they release their constituent quarks in a fleeting ‘Little Bang’. This will take us back to the time before these particles formed, re-creating the conditions early in the evolution of the universe, when quarks and gluons were free to mix without combining(“LHC ‘Big Questions’,” 2012c, emp. added). It is not a matter of whether the LHC will create a Big Bang, a “Little Bang,” or a “mini-Big Bang” (Moskvitch, 2010). It cannot generate any “Bang,” as defined within a cosmological origins scenario. Notice next, the third bulleted statement in the LHC’s response, which states that the conditions produced artificially in the LHC “are continually being produced naturally (by high energy cosmic rays hitting the earth’s atmosphere)...” (“LHC ‘Big Questions’,” 2012b). This simple statement has some profound implications. Especially when it is recognized that the set of conditions and energies to be produced at the LHC have and are being continually produced in nature, and are not a unique characteristic found only in the Big Bang scenario. As the parenthetical phrase states, nature’s equivalent to the LHC occurs when high-energy cosmic rays collide with Earth’s upper atmosphere. Cosmic rays are very high-energy, subatomic particles that are produced from outside our solar system and within our galaxy. Some of these particles stream into Earth’s atmosphere, colliding with atmospheric particles to produce showers of lower-energy, secondary particles. Many of these cosmic rays are at energies comparable to and greater than the maximum estimated center-of-mass energies of the two counter-rotation proton beams of the LHC. In fact, the approximate rate at which such comparable cosmic rays enter Earth’s atmosphere is an astounding 250,000 particles per second, with over 7.8 trillion events occurring per year (Ellis, et al., 2008, p. 4). Do not let this fact escape notice: although the Big Bang theory requires extremely high-energy conditions in its model, the ability to produce such conditions (or the simple existence of such conditions) does not prove that the Universe came into existence in such a manner. Such conditions are involved in ongoing natural processes, of which scientists presently are deepening their understanding. The connection between the LHC and the cosmic-ray interactions is much more tangible. Consider the following: (1) the high-energy, cosmic-ray interactions in the atmosphere can be observed, measured, and tested in real-time data; (2) hypotheses can be verified or falsified, then adjusted; (3) subsequent predictions can be made and entire processes from beginning to end can be observed; (4) theories can be updated based on the concrete observations; and (5) results can be applied to the current working knowledge. Yet this connection apparently does not make headlines. To those who might question the validity of a comparison between the LHC collisions and cosmic-ray events, notice that this same comparison is used as a central argument in a report by the LHC Safety Assessment Group (LSAG), which was tasked by CERN with addressing various safety concerns relating to the LHC experiments. As an overarching argument supporting the LHC as a safe endeavor, the authors drew upon this comparison to show that if Earth, Jupiter, the Sun, and countless stars across the galaxy can survive the enormous number of cosmic-ray collisions in their atmospheres (as evinced by their existence today), then the speculations about microscopic black-holes being created, growing, and consuming Earth, are unsubstantiated. The report’s abstract stated an important fact: the center-of-mass energies of the LHC collisions are “less than those reached in the atmosphere by some of the cosmic rays” (Ellis, et al., p. 1). In summarizing their arguments, the authors state, “Thus, the continued existence of the Earth and other astronomical bodies can be used to constrain or exclude speculations about possible new particles that might be produced by the LHC” (p. 5). Also consider the following two quotes by Stephen Hawking of Cambridge University and Edward Kolb of the University of Chicago, respectively, who are quoted among many distinguished physicists and cosmologists on the CERN Web site. The world will not come to an end when the LHC turns on. The LHC is absolutely safe.... Collisions releasing greater energy occur millions of times a day in the earth’s atmosphere and nothing terrible happens (“The Safety of the LHC,” 2008). Nature has already done this experiment.... Cosmic rays have hit the moon with more energy and have not produced a black hole that has swallowed up the moon. The universe doesn’t go around popping off huge black holes (“The Safety of the LHC,” 2008). Interestingly, a 2003 press release, which announced the upcoming 50th anniversary of CERN, stated: “This new research facility—a 27 kilometre circular particle accelerator—will smash protons and other nuclei together head on, creating conditions that have not existed since the Big Bang” (“CERN Prepares...,” 2003). Of course, this statement is an obvious contradiction to the previous quotes discussed above. However, can it be explained as accurate to the current knowledge of that time, which has undergone developments since 2003? The answer is no. Although the press release stated that such conditions had not existed since the Big Bang, a safety report tasked by CERN was published the same year, and referenced how high-energy, cosmic rays represent a close comparison to the particle energies expected in the collisions of the LHC. In fact, the first sentence under the subsection titled “Cosmic Rays” stated, “Cosmic-ray processes reach the energies and energy densities that will be encountered at the LHC and, therefore, they may provide limits on possible disaster scenarios” (Blaizot, et al., 2003, p. 4). The report also referenced peer-reviewed papers from the journals Reviews of Modern Physics (Jaffe, et al., 2000) andPhysics Letters B (Dar, et al., 1999) with similarly-based arguments. From the earliest experiments of the composition of the atom, scientists have used particle collisions and the resulting interactions as a method to discover some of the most fundamental descriptions of matter. In these experiments, the fundamental laws of conservation (conservation of energy, momentum, charge, etc.) are the overarching guiding principles. These laws allow scientists to track the various collision results, knowing that predetermined input parameters (mass, energy, numbers of particles, and/or types of particles) restrict the possible output. Thus, scientists work from the existing input of mass-energy, knowing that the output must be derived from, and cannot exceed, the input into the closed system. Every natural source of energy, from the combustion in car engines to the Sun’s light to the spectacular supernovae, are described by the conservation laws of nature. Even the horrifyingly tremendous amount of energy released in a nuclear explosion is subject to the amount of mass-energy initially present. In the LHC, scientists are not creating matter/energy that was not already present. Likewise, the same is true for any Big Bang model—matter/energy cannot be created nor destroyed in the physical Universe by natural means (cf. Miller, 2007; Miller, 2010). Thus, from whence did it come? With some initial “hiccups” (see “CERN Releases...,” 2008), the world’s largest particle accelerator, the Large Hadron Collider, began full operations in 2009. The enormous structure, complex engineering, precise detectors, extreme conditions, and intricate experiments that have been developed by many thousands of highly intelligent scientists and engineers over many years, are astounding. How is it that such immense intelligence is required in order to try to “recreate” an accidental, chaotic, purpose-less event—the Big Bang? Is this not an incredible contradiction? Yet, such is the sentiment with each press release and news headline that dubs the LHC the “Big Bang Machine.” When addressing this very question, “How did our Universe come to be the way it is?,” CERN’s own Web site replies matter-of-factly, “The Universe started with a Big Bang—but we don’t fully understand how or why it developed the way it did” (“LHC ‘Big Questions’,” 2012d). In this statement, no doubt is expressed as to whether the Big Bang event occurred, rather just a casual admission of lacking understanding in the details—including the supposed 13.7 billion years that followed. It would be unimaginable to describe the enormous efforts undertaken by those at CERN and the LHC to engineer, construct, and deploy such an amazing technical feat as anything but extraordinary design. It is more unimaginable to attribute anything but Divine design to the intricacies, precision, and complexities seen at every scale of the Universe. “ATLAS—A Toroidal LHC Apparatus,” (2008), CERN, http://public.web.CERN.ch/Public/en/LHC/ATLAS-en.html. “‘Big Bang’ Machine Ready to Smash Records,” (2010), CBS News, March 30, http://www.cbsnews.com/stories/2010/03/29/tech/main6344326.shtml. “Big Bang v2.0” (no date), http://www.wired.com/wiredscience/2008/09/top-5-large-had/. Blaizot, J.P., J. Iliopoulos, J. Madsen, et al. (2003), “Study of Potentially Dangerous Events During Heavy-Ion Collisions at the LHC: Report of the LHC Safety Study Group,” CERNScientific Information Service, http://doc.CERN.ch/yellowrep/2003/2003-001/p1.pdf. Boyle, Alan (2008), “Scientists Turn on Biggest ‘Big Bang Machine,’” MSNBC, September 10, http://www.msnbc.msn.com/id/26439957/. “CERN Celebrates Discoveries and Looks to the Future,” (2003), CERNPress Release, September 2, http://press.web.CERN.ch/press/PressReleases/Releases2003/PR12.03EWZsymposium.html. “CERN Inaugurates the LHC” (2008), CERNPress Release, October 21, http://press.web.CERN.ch/press/PressReleases/Releases2008/PR16.08E.html. “CERN Prepares for 50th Anniversary” (2003), CERNPress Release, July 1, http://press.web.CERN.ch/press/PressReleases/Releases2003/PR10.03ECERN50.html. “CERN Releases Analysis of LHC Incident” (2008), CERNPress Release, October 16, http://press.web.CERN.ch/press/PressReleases/Releases2008/PR14.08E.html. Dar, Arnon, A. DeRujula, and Ulrich Heinz (1999), “Will Relativistic Heavy-Ion Colliders Destroy Our Planet?,” Physics Letters B, 470[1-4]:142. Ellis, John, Gian Giudice, Michelangelo Mangano, et al. (2008), “Review of the Safety of LHC Collisions,” Journal of Physics G: Nuclear Particle Physics, 35:115004. “Facts and Figures” (2008), CERN, http://public.web.CERN.ch/Public/en/LHC/Facts-en.html. Jaffe, R.L., W. Busza, F. Wilczek, and J. Sandweiss (2000), “Review of Speculative ‘Disaster Scenarios’ at RHIC,” Reviews of Modern Physics, 72:1125. LHC ‘Big Questions’” (2012a), http://www.lhc.ac.uk/About+the+LHC/LHC+Big+Questions/11841.aspx. “LHC ‘Big Questions’” (2012b), http://www.lhc.ac.uk/About+the+LHC/LHC+Big+Questions/17709.aspx. “LHC ‘Big Questions’” (2012c), http://www.lhc.ac.uk/About+the+LHC/LHC+Big+Questions/17735.aspx. “LHC ‘Big Questions’” (2012d), http://www.lhc.ac.uk/About+the+LHC/LHC+Big+Questions/17733.aspx. Miller, Jeff (2010), “The Laws of Thermodynamics Don’t Apply to the Universe!” Apologetics Press, http://apologeticspress.org/article/3704. Miller, Jeff (2011a), “Higgs Boson—The ‘God Particle’?” Apologetics Press, http://apologeticspress.org/apPubPage.aspx?pub=1&issue=977&article=1500. Miller, Jeff (2011b), “Higgs Boson—Update,” Apologetics Press, http://apologeticspress.org/article/4120. Moskvitch, Katia (2010), “Large Hadron Collider (LHC) Generates a ‘mini-Big Bang’,” BBC News, November 8, http://www.bbc.co.uk/news/science-environment-11711228. “The Safety of the LHC” (2008), CERN, http://public.web.CERN.ch/Public/en/LHC/Safety-en.html. “Stephen Hawking Tours the Future of Particle Physics at CERN” (2006), CERNPress Release, October 2, http://press.web.CERN.ch/press/PressReleases/Releases2006/PR13.06E.html. Than, Ker (2011), “Densest Matter Created in Big-Bang Machine,” National Geographic News, May 24, http://news.nationalgeographic.com/news/2011/05/110524-densest-matter-created-lhc-alice-big-bang-space-science.